2nd Friday of each month at 11:00 AM. 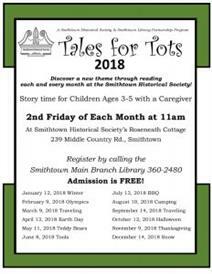 Story time for children ages 3-5 with a caregiver at Smithtown Historical Society's Roseneath Cottage. Register by calling the Smithtown Main Branch Library (631) 360-2480.